This is the first of a three-part series devoted to farm bill conservation compliance, the foundation of soil and water protection on the majority of land in the United States. Annually, soil erosion caused by agricultural practices costs the United States approximately $44 billion and a loss of 1% of our topsoil. Agricultural nonpoint source pollution (e.g. fertilizer runoff) is “the leading source of water quality impacts” to our nation’s rivers and streams as well as the second largest contributor to wetland pollution. This post introduces the conservation compliance provisions and explains why they are critical to the United States’ overall environmental health. The seemingly broad term “conservation compliance” is actually focused on conserving two types of resources: highly erodible soils and wetlands. Conservation compliance uses the government’s “power of the purse” to achieve a base level of conservation on agricultural lands. Specifically, the United States Department of Agriculture (USDA) conditions receipt of farm bill benefits (such as loans, crop insurance and commodity subsidies) on farmers reducing soil erosion and protecting wetlands. The Natural Resource Conservation Service (NRCS) and the Farm Service Agency (FSA), agencies under the USDA, jointly administer the conservation compliance provisions. Failure to comply risks the loss of farm bill financial benefits and assistance. Soils that NRCS designates as highly erodible land (HEL) are subject to conservation compliance provisions. HEL refers to land where: (1) soil erodes at rates that cannot sustain continued crop production; or (2) poor soil health restricts what crops can be planted or what activities can occur, based on soil classifications. NRCS determines what land is highly erodible through soil surveys, as required by Congress. In 2007, the NRCS designated roughly 40% of all crop land in the United States as highly erodible. Under the HEL requirements, farmers can still grow crops on highly erodible land, but they must comply with a conservation plan. Usually, farmers can keep USDA benefits if they reduce soil erosion to a level determined by NRCS to be twice the rate that soil is being replenished. Soil health became a national priority in the aftermath of the Dust Bowl of the 1930s, which revealed the devastating economic and environmental effects of soil erosion. In fact, soil health was such a priority that Congress created the Soil Conservation Service, the precursor to NRCS. As Hugh Bennet, the father of NRCS, pointed out, some soil erosion will inevitably result from wind, water, and farming practices. 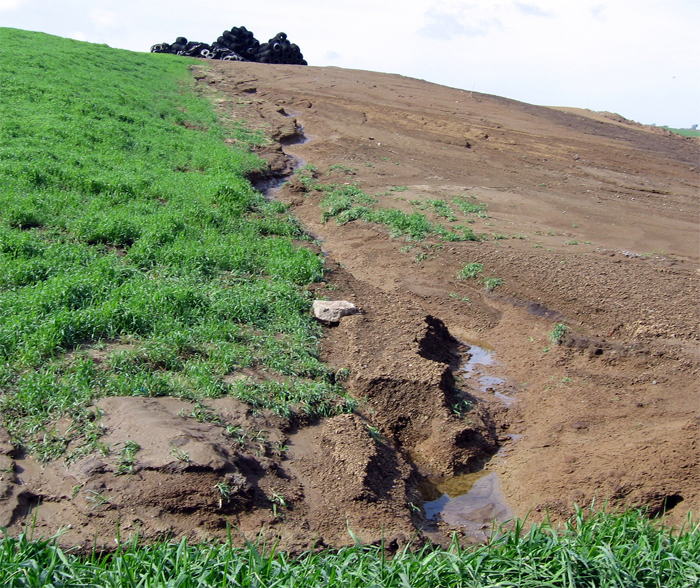 Mismanagement of farm land exacerbates the rate of soil erosion. When soil erodes, it threatens the natural ecoservices that healthy soil offers. These “free” services include improved water quality, water conservation, decreased pest burdens, and healthier crops. Ultimately, the purpose of the conservation plans is to reduce the rate of erosion and improve soil health. Wetlands are subject to conservation compliance measures commonly referred to as “Swampbuster.” In exchange for farm bill benefits, farmers agree not to plant crops on wetlands converted after December 23, 1985 and not to convert wetlands in any way that would make agriculture production possible. The 1985 date is significant because, not only is that the year that Congress enacted conservation compliance provisions, but, at that time, over half of our nation’s wetlands had been drained for agriculture or development. With that loss of wetlands, we also lost valuable ecoservices that wetlands perform by providing habit, storing floodwaters, filtering pollutants, and sequestering carbon. The Swampbuster provisions seem more stringent than the Sodbuster provisions because they prohibit any wetlands conversion. Yet, there are many exceptions to Swampbuster conservation compliance. For instance, a farmer can grow crops that could grow naturally in a wetland without jeopardizing financial assistance. And, artificially created wetlands or wetlands authorized for conversion under the Clean Water Act are exempt from conservation compliance. Farmers can also convert wetlands “if they compensate for the wetland functions that are lost.” In other words, the Swampbuster provisions tend to focus on the conservation of wetland functions as opposed to the preservation of existing wetlands. At the heart of conservation compliance is a policy of voluntary conservation rather than environmental regulation. There are several reasons for this voluntary approach, including the fact that agriculture enjoys many exemptions from federal environmental regulation and the unique role of agriculture in the American mythos. This next post in this series will explore some of the challenges to implementing robust conservation compliance and summarize policy considerations in light of the forthcoming 2018 farm bill.